12 O'Clock Track / Music 12 O'Clock Track: Gull, "Fast Enough"
Chances are you've never seen a street musician quite like Nathaniel Rappole, who made a name for himself busking in Richmond, Virginia. As Gull, Rappole takes the ludicrous "man plays several instruments at once" gimmick (Mary Poppins, anyone?) and uses it to make actual songs and stuff that people might even want to listen to. Like today's 12 O'Clock Track, "Fast Enough." The echo-laden math rock is pleasant enough to listen to, but it's umpteen times more fascinating to watch on YouTube. 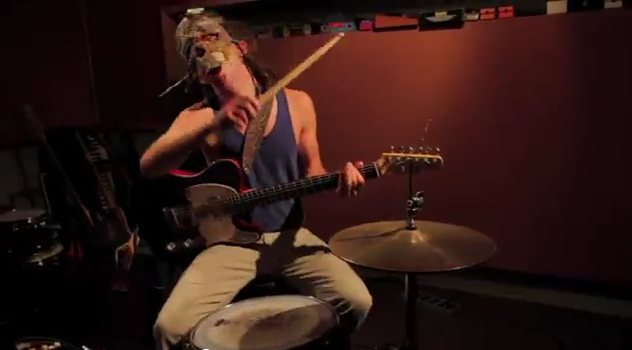 Brooklyn record label and video site Wreckroom filmed it, offering what's easily the highest quality video of Rappole in action—the fingers on his left hand race up and down the neck of his guitar, his right hand dramatically slams a lone stick into his drum kit, and he bobs his head wildly as he sings into what looks like a castaway Slipknot mask rigged with a microphone. Here's hoping some enterprising local multi-instrumentalist is taking notes—I'd love to have something like Gull soundtrack a walk down Michigan Avenue.